CLICK ON THE PLAY BUTTON OF THE IMAGE BELOW TO HEAR THE SONG AND YOU CAN OWN IT FOR $1.99 WHICH ALSO SUPPORTS THE RAINBOWS AND SUNSHINE DONATION PROGRAM! Children’s favourite singalong nursery rhyme and action song with an appealing and upbeat musical arrangement! Our version of The Wheels on the Bus has fun verses with great sound effects and cute voices adding comments to the traditional verses. Lots in this song to stimulate children’s imagination and encourage their creativity! It’s a brand new release and children are loving this! 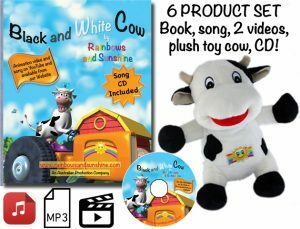 Rainbows and Sunshine has many nursery rhymes and traditional songs for little songsters to enjoy including well know favourites like Twinkle Twinkle Little Star, Incy Wincy Spider, Old MacDonald Had a Farm, Row Row Row Your Boat, 10 in the Bed, etc. You can see them all under the SONGS menu above, available here individually and also on the album “Rainbows and Sunshine” which is 51 minutes (15 songs) of fun. Also available on iTunes. Plus we have a range of fantastic 3D animated videos which have song-stories. Both “original” versions and “sing along” version with the words on the screen while the videos play. These are listed under the menu VIDEOS above. 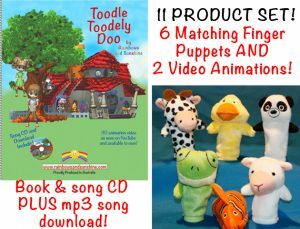 Our signature products are certainly amongst our most popular – these are complete matching sets which have the song as an mp3 download and CD, a beautiful hard copy book, 3D animated videos which have the song-story underneath, and toys to match the characters too. You can check these out under the BOOKS AND TOYS menu above. And below are details of two of these.